Brian Stephens had a rough day in this July 1990 game, until his last at bat, according to The Seattle Times. Stephens used his last at bat to hit a game-winning single, The Times wrote. "I tried to concentrate a little bit extra to get the job done," Stephens told The Times. "It's wonderful when you get an opportunity like that." Stephens got that opportunity in his second season as a pro. He saw few other opportunities. He played in one more season. He never saw AA. Stephens' career began in 1989, signed by the Mariners as an undrafted free agent out of Hillsborough Community College in Florida. Stephens started with the Mariners in the rookie Arizona League. He made the league all-star team and hit .273 in 35 games. 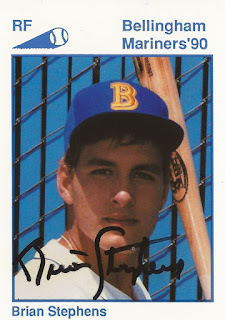 He moved to short-season Bellingham for 1990. He got into 59 games and again hit .273. He then split 1990 between high-A San Bernardino and high-A Reno. He hit .318 in 54 games at Reno, then moved to San Bernardino and started out in a slump, according to The San Bernardino County Sun. "I think he put a lot of pressure on himself when he first came over," San Bernardino manager Tommy Jones told The Sun. "He knew he was struggling a little bit. I think he tried to do too much, too quick." Stephens ended up hitting .226 at San Bernardino, hitting a home run later in July. That season marked his final as a pro.